Press the trunk release button for approximately one second to unlock and open the trunk. When the driver’s door is locked: The trunk will lock when it is closed. When the driver’s door is unlocked: The trunk will not lock when it is closed. 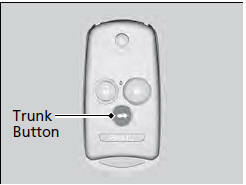 When the ignition switch is in any position except LOCK 0, you cannot open the trunk using the trunk release button on the remote transmitter.